Brown your ground beef and season it like you would do a hamburger. I seasoned mine with Creole seasoning, a few dashes of worcestershire sauce. After done, I drained the grease and then added in bacon that I had already prepared and chopped into pieces. Wet your eggroll wrapper and place it in front of you so it looks like a diamond rather than a square ( I took this photo before I corrected it) You want the filling to go straight from corner to corner. 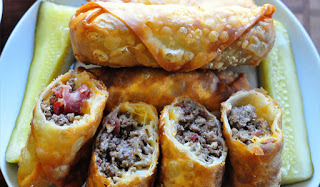 Fill with ground beef and bacon mix and top with a nice heap of shredded cheese. Roll by taking the bottom corner and tucking it under the filling. Then bring in both sides and continue to roll. *Your wrapper needs to be wet so it will stick and not come apart when cooking. I deep fried mine for added crispiness but you can place in the oven at 325 until brown.